Tile saws are sure a great invention, but they are mostly good for just straight cuts, and there are times when we need more than just straight cuts. If you need to cut or fix a tile around your commode, bath or shower then using a tile saw can be very difficult. Also if you want to cut a small portion of the tile or a small tile overall, then a tile saw can end up cutting more than you actually want. Even worse, it can break the entire tile. Tile saws are also not very economical, and if you just want to fix one tile, then this can be a big expense for you. Fortunately, there are some methods using which you can cut and fix a tile without a from tile saw. You will have to put more time and efforts into these, but they sure are worth a try for the cost they come for and the results they provide. 1. For slight curves, you'll have first to make a template on a piece of paper. On the side of the template facing the curved surface, add ½ inches. Next, you'll have to cut multiple fringes (like cuts, 1/2 inch long each along the curved side of the paper). After that, push the piece of paper onto the curved surface and keep bending the cuts (fringes) until you match them with the curve. These fringes should make a proper curve. 2. Place this piece of paper on top of the tile you want to make cuts on and trace the curves on it. 3. Using a tile cutter, make several depressions from the corner of the tile towards the curved line. We refer to these cuts as relief cuts. 4. Next, place the tile cutter at the edge of the curve made. Start cutting but remember to move your saw as you go, for a precised and smooth cut. Take your time, don’t rush and pay attention every little cut or else you might mess up the whole tile. Items needed: A tile, drill, double-sided sanding stone, clamps and a tile cutter. 1. To get started with the process, you need to measure the area where you plan to fit the tile. You need to minus about a ¼ inch for the spacer as it will determine the exact size to cut your tile. Now that you've measured everything and also determined the size mark a line across your tile at that distance. On top of the tile, hold a straight edge and make sure this edge lines up with the mark you made earlier. Get your scoring tool and score the line that we just made and try to bend the tile along this line. You'll notice that the tile has started to break along the line (the cut that we wanted). 2. The cut from the above step won’t be as smooth, so we need to use a tile cutter next. Place your cutter on the edge of the cut we just made and start cutting. The outer part of the line is a part of the tile we are cutting. Also, remember that tile cutter gives best results when used for L-shaped cuts. You'll have first to mark your tile then cut along these lines (outside of these lines). 3. Next, to cut a hole, you'll need a tile hole-cutting bit, and then, you'll have to attach it to your drill to be able to drill a hole into your tile. To make a proper hole, the tile should be positioned such that it doesn't move even after using the drill. Secure your tile to a smooth surface using either clasps or clamps. Hold your drill properly and start drilling the tile from top to bottom, make sure the drill gets through the tile. To smoother out the cut edges of the hole we just made, use a wet, double-sided sanding stone. For an even smoother look, round its top and bottom edges. Items needed: A tile, nipper and a scoring tool. 1. Scratch along low line curves using the scoring tool and after that score many vertical lines (90 degrees) starting from the curve to the corner of the tile. Then scratch many more lines diagonally across these vertical lines. Tip: if you score more lines, the chance of nipping away from the extra tile easily will increase. 2. Next, turn your scoring tool to the other side (to the nipper side) and then hook the cut over the edge of your tile. Hold your tile above a dustbin so as the pieces don’t scatter and go directly into the bin. 3. Put some force onto the nipper and press it down so that it can easily remove the pieces. The process of nipping should be continued until you get the desired part cut. The tile will break along the lines we scored earlier. An oscillating multi-tool or a usual saw with a tile blade can be used to cut an already installed tile or to cut a small portion of it. A tile nipper is a perfect tool if you want to nip away pieces of a tile. The blades are quite dull, and they'll let you nibble away at the edge of a tile and make curves. 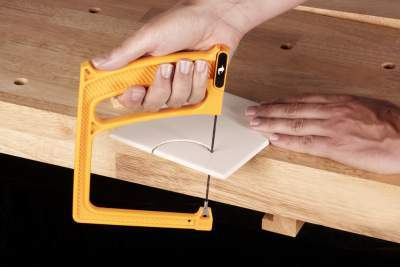 This tool will allow you to cut a few tiles without spending a lot of money. If you want to make a hole into a tile, then you should go for this one. RotoZip, especially is the best tool if you want to make a hole within a tile for pipe, etc.